Watergate forever changed American politics, and in light of the revelations about the NSA's widespread surveillance program, the scandal has taken on new significance. Yet remarkably, four decades after Nixon was forced to resign, no one has told the full story of his involvement in Watergate. Nixon know and when did he know it? 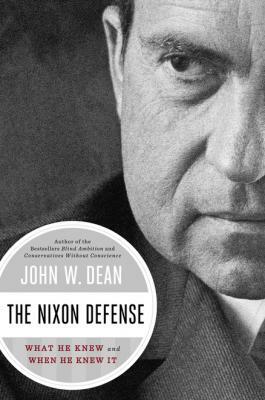 Through narrative and contemporaneous dialogue, Dean connects dots that have never been connected, including revealing how and why the Watergate break-in occurred, what was on the mysterious 18 1/2 minute gap in Nixon's recorded conversations, and more. In what will stand as the most authoritative account of one of America's worst political scandals, The Nixon Defense shows how the disastrous mistakes of Watergate could have been avoided and offers a cautionary tale for our own time. John W. Dean was legal counsel to president Nixon during the Watergate scandal, and his Senate testimony helped lead to Nixon s resignation. In 2006, he testified before the Senate Judiciary Committee investigating George W. Bush s NSA warrantless wiretap program. He is the New York Times bestselling author of Blind Ambition, Broken Government, Conservatives Without Conscience, and Worse Than Watergate."